Three weeks ago, we received the brace featured in the above picture for Alex and Cynthia took this picture minutes after we put it on her. Alex is doing better, but Cynthia and I know that she has a long road to recovery, and we’ll do our best to help her get back to her old hyper self. Have a great week and enjoy your canine companions. 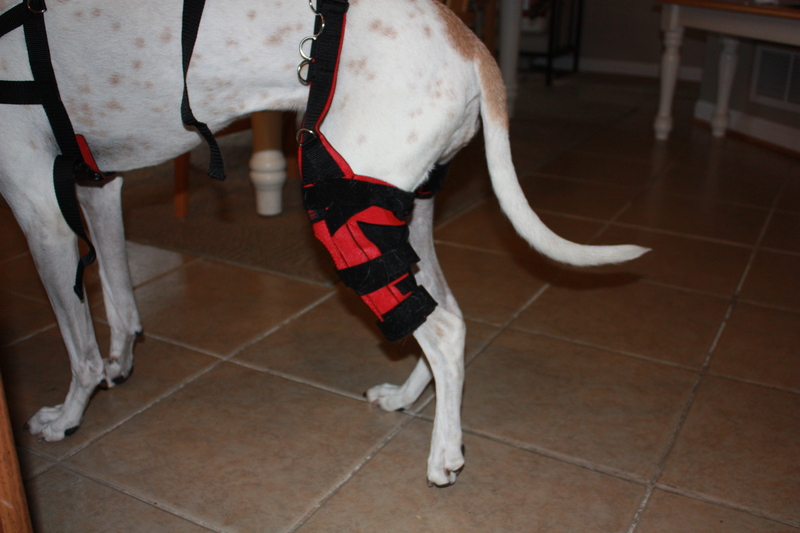 This entry was posted in ACL Injury, Breeds, Dog Equipment, Dogs, Humor, Nutrition, Outings, senior dogs, Walking and tagged Anterior cruciate ligament injury, Bedrest, dog brace, Knee, Nylabone, supplements, warm compress. Bookmark the permalink. Happy to hear that Alex is on the road to recovery! From what I’ve read about recovery–whether you have the surgery or go with the conservative route, unfortunately not matter what, it’s a lengthy and patience-testing process. Keep up the good work–slow and steady! 🙂 By the way, is that a brace from WoundWear? Hi Ryan. Yes, you are right, the road to recovery, whether surgery or just the brace, is a very long, long road. Alex wears her brace during the day, but we remove it at night time. We’ve noticed that she can walk a couple of steps without limping in the morning, but she is still mostly on bed rest which she loves anyway. Yes the brace is from WoundWear and at least for Alex is working fine. So sorry to hear about Alex’s injury. I see from other posts that her recovery seems to be coming along nicely. So happy that things are going well. Thanks for your kind words. Yes, Alex damaged her ACL last year and now she has to wear a brace for a pretty long time. I opted for that rather than surgery because Alex reacted pretty bad the last time she had to be put under and also because she is almost 12 years old. Best wishes from all at Little Dogs Laughed for a good recovery for Alex–it sounds like Alex is responding well-here is to a happy and healthy 2014 for all your pets and guests! Thanks for your well wishes:-) The best to you and your family in this rapidly approaching year. Trev and I continue to lift thoughts of health and healing her way!!!! Hydrotherapy…I always thought that was such a wonderful idea for dogs…Hugs to you and yours !!!! Thanks a million for your well wishes:-) Happy Holidays to you, Trev and family. Awww! Best to you and Alex!! Interesting…my bulldog was just diagnosed with a partially torn ACL yesterday. Was your dog a partial or complete tear? How many week is your dog supposed to use the brace? Alex’s is a complete tear. How long with a brace? About a year or so. She’ll be going for hydrotherapy sometime in May because the cold seems to aggravate her injury and to transport her from home to the hydro facility and back now that is cold would not work for her. Alex, I cross all my 4 paws for you and send you a big hug and all my best wishes for your recovery. Been through that with our Monty. Will take about a year and keep Alex as quiet as possible. If available take her for aqua therapy in about two moths. Yes, that’s what I figured. Thanks for your input and advice. 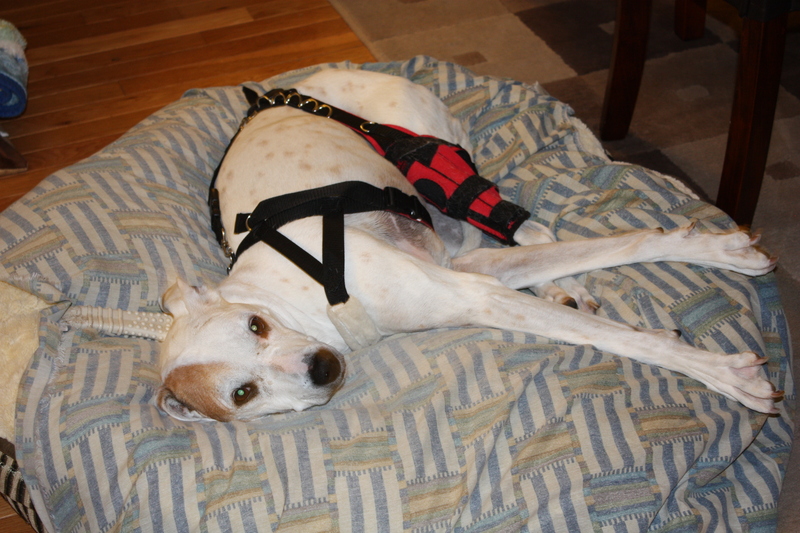 Yes, we are doing our best to keep our hyperactive girl relaxed and with plenty of bed rest. Aqua therapy I was planning to do by the time she had 2 months wearing that brace, but the cold weather really seems to aggravate her injury more so I’ll probably start her on that around May. The 2 times we took her out was only for a couple of minutes and right after that she started to limp more.